No other home project is as crucial for protecting value than putting on a new roof. 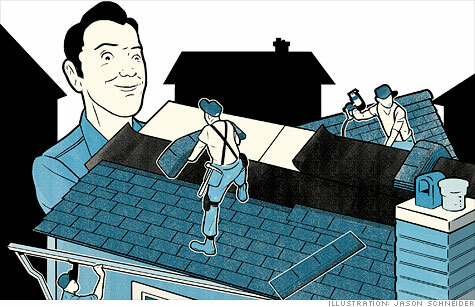 (MONEY Magazine) -- It's hard to imagine a less enjoyable way to blow $5,000 to $15,000 (or more) than putting on a new roof. You'll see your yard saturated with shingle bits and nails (probably leading to a flat tire or two) and have to deal with roofers, some of whom deserve the trade's bad reputation. Still, it's a key job that can jack up your home's curb appeal, and the process doesn't have to be a nightmare. Leaks can be repaired. Missing shingles can be replaced. Look up at your roof through binoculars. Only if you see widespread breaking, curling, cracking, or mossy shingles -- or areas where the granules have worn away -- do you need to spring for a new one, says Jim Kirby of the National Roofing Contractors Association. Get bids from three roofers, to compare not just prices but also their attitude and approach. Then hire someone who is willing to: (1) get a building permit, (2) remove only as much roofing each day as he can reinstall by the end of that day, (3) lay protective plywood over decks and patios, and tarps over walls, the lawn, shrubs, and unfinished areas, and (4) clean the job site every night. He should also install vents at the roof's peak and under the eaves -- and agree to specify all that in the contract. Questions about home repairs? Send them to The Help Desk. Ask whether he'll be using a subcontractor, in which case you need references, proof of liability, and workers' comp insurance from both the main man and the sub. If you have two or more layers of old roofing, building codes require you to strip them off -- adding $1,000 to $3,000 and creating a huge mess. But as long as you're not selling soon, removing a single existing layer is still a good idea, says Palatine, Ill., roofer Andy Nyberg. That will add $500 to $2,000 to the bill but allow the roofer to repair decking and worn flashing (the metal seals between the roof and adjacent surfaces). In a cold climate he can install a rubber membrane called ice and water shield, which prevents leaks when the gutters freeze up. No need to spend $50,000 or more for slate or wood shingles, but do get the best asphalt on the market. And ask for architectural shingles. They cost a few hundred more than standard ones, but their varied coloring and thickness add sophistication and beauty to any building.